And we can’t agree any more with this sentence. There are just so many of our fond memories-like our parents anniversary, friend’s marriage, our first pet, our trek with the colleagues and many more that we have captured in these minute pixels. With the convenience of taking digital photographs from our phone camera, we don’t know just how many moments we have stored on our smartphones. Therefore, after switching from an iPhone 7 to a Samsung Galaxy S8, you don't want to leave these precious photos behind the iPhone 7. Well, how to transfer photos from iPhone 7 or iPhone 7 Plus to Samsung Galaxy S8? iPhone and Samsung are running different operating systems, therefore, we can't use traditional Copy&Paste method to do the transfer. We have to ask help from third-party software like the iPhone to Samsung Transfer. 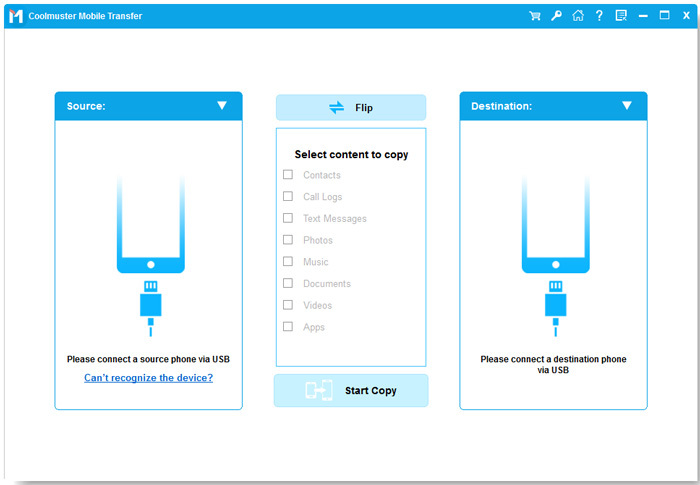 This application helps you to easily transfer contents between your old and new phones in just one click irrespective of the platforms of either of the phones. Be it contacts, text messages, songs, photos, videos, apps, you name it and this utility application help you transfer almost everything in minutes. 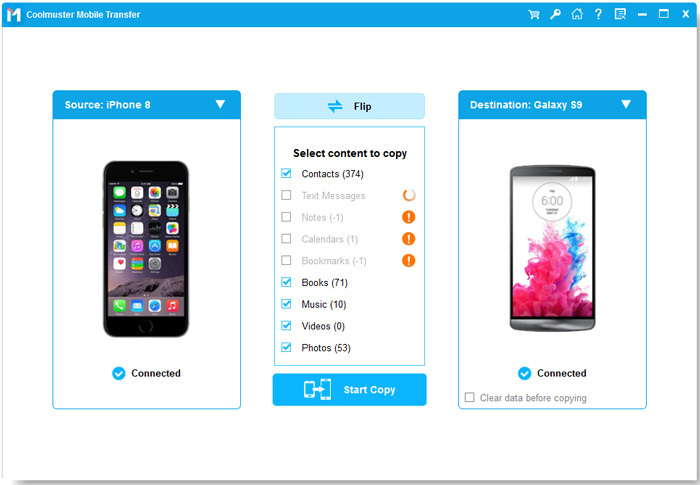 With 100% OS compatibility and risk free transfer assurance, this application lets you transfer data between any two same or different platforms without compromising on the quality of your data. It supports iPhone 7/7 Plus/6S/6/5S/5, Samsung Galaxy S8/S7/Edge/S6/S5/Note 7/6/5/4, as well as other more iOS, Android and Symbian devices. Tips: If you have lost important photos from your iPhone, you can refer to the specific guides on how to recover lost photos from iPhone, and how to backup iPhone photos on computer. How do I transfer photos and pictures from an iPhone 7 to a Samsung Galaxy S8 by using Coolmuster Mobile Transfer? Read on to learn the details. 3 step guide will help you get through the process of iPhone to Samsung photos transfer. How to Move Photos from iPhone 7/7 Plus to Samsung S8? Install and launch the transfer application on your computer. Connect both your iPhone 7 and your Samsung Galaxy S8 to the computer using the USB cables. From the main interface that appears, select the Phone to Phone Transfer option which will direct you to a new window. The new window displays all the contents i.e. photos, videos, contacts, apps which are there in your old and the new phone. Select "Photos" option from the content list and then click on the "Start Transfer" button in the middle. It will start transferring the selected photos which you can see in the progress bar. It is a downloadable program and fairly easy to use. Just click the download it for free to have a try!